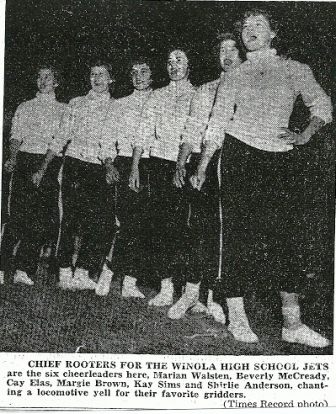 The History of the Winola High School "Jets"
New Windsor (population 720) is situated on Il. Rt. 17 seven and one-half miles east of US. Rt. 67. If you are unfamiliar with the area, New Windsor is about 23 miles (as the crow flies) south and a little east of the Quad Cities. New Windsor sits on the far east-central edge of Mercer County. The town hosts an annual rodeo which draws competitors and spectators from all over the midwest. Winola High School is the result of a consolidation effort of the towns of Viola and New Windsor. 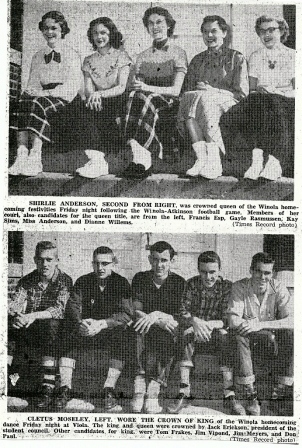 The consolidation of the two high schools took place before the 1952 school year began. The high school students recieved their education in the HS building in Viola. 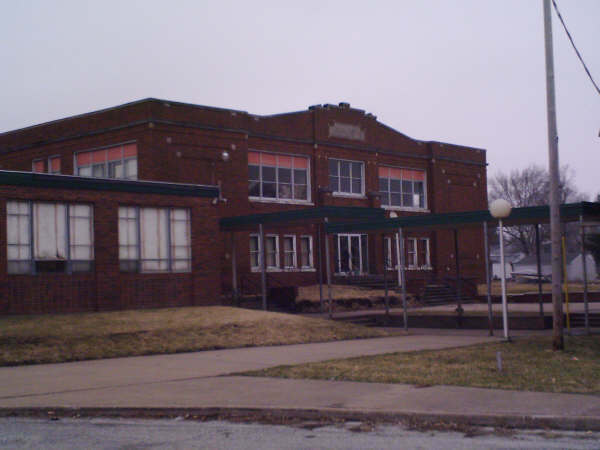 Winola School District enjoyed four decades of many successes before being deactivated in 1988. As a result of the deactivation the high school students from New Windsor and Viola now attend Sherrard High School in Sherrard. 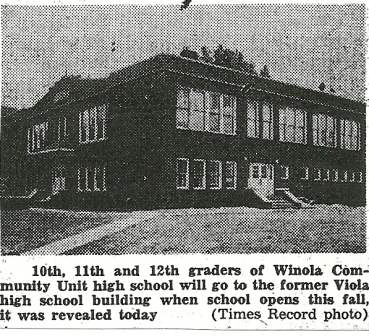 The Winola High School building still rises tall and proud in the town of Viola, though now used for private purposes. School Fight Song: "Go You Winola"
The tune of "Washington and Lee Swing"
Very limited information is available on the IHSA web site regarding athletics offered at Winola High School. Successes were only found in boys basketball, and boys and girls track. It is probable that football, girl's volleyball, and girl's basketball were also offered. 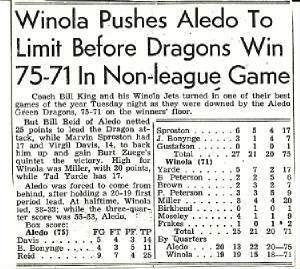 Winola spent several years competing in the old Cornbelt Conference. The IHSA success of the Winola teams is listed below. Assistance is being sought regarding the many great Winola teams that did not bring home IHSA hardware. Bill Mack was a Winola coach then. He went on to coach at Crystal Lake, then North Central College and, after he retired he volunteered as an assistant at Beloit. I imagine his record is available on the website for Hall of Fame coaches. It certainly wasn't because of his Winola record that he made the Hall of Fame but in his defense we had a lot of injuries. The boys basketball program won a District title in the school's first year of existence. We are in need of the team's record and coach's name. In fact, we are searching for all of the school's team records, coach's names, and individual accomplishments. Several scores were located on a website titled "Illinois Postseason Basketball Scores" which involved Winola High School in the IHSA Stae Tournament. The scores we located are listed below. 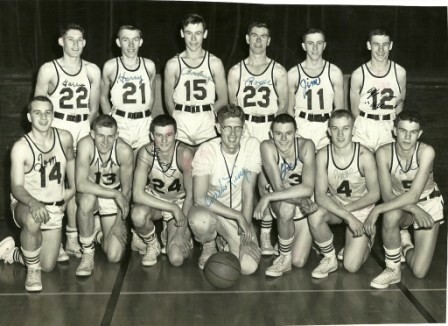 Back row: Garry McNeil, Harry Peterson, Rodney Garret, Roger Birkhead, Jim Myers, Ken Brown. Little York won Regional title. **All other season records, coaches' names, and postseason scores are needed. Two individuals brought home hardware from the IHSA Boys State Track Meet! Two ladies also earned medals at the IHSA Girls State Track Meet. Julie Goben earned a STATE CHAMPIONSHIP in the high jump in 1983!! Lisa also won two other medals in the high jump, making her a three-time medal winner at the meet. 1982-83 Julie Goben High Jump STATE CHAMPION!! We know the Jets played football. So far this is the extent of the information we have obtained. "The initial Winola football coach was Leo Traister, who had been at Viola prior to consolidation. He later moved to VIT and Eureka College. Bill Mack, now in the IHSA coaches Hall of Fame, began his career at Winola in 1960. I believe he was there 4 years." 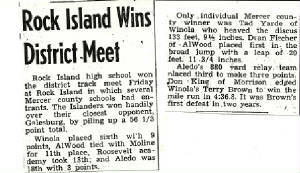 Research by Dean Bentley showed the Winola High School boys competed in wrestling as well. A 1976 Winola High School yearbook revealed the grapplers of this year had a record of 7 - 10. Any other information regarding Winola HS wrestling is welcome. The 1976 yearbook shows that Winola High School also participated in girls volleyball. In that particular season in fact they were quite good at it! The Lady Jets competed in basketball as well. We only have the record from the 1975-76 season currently available. Please contact us if you have further informaton to share. "I grew up in New Windsor and attended Winola High School. 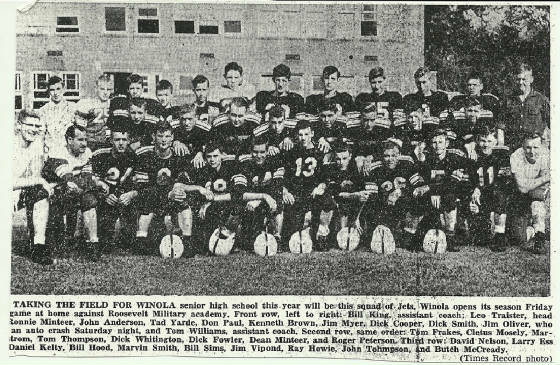 Bill King came to New Windsor to coach in 1950 and continued as the Winola coach until the '70's I have several yearbooks with records from the late 50's and 60's.I will try to uncover some additional information. The first Winola football coach was Leo Traister who had been at Viola and stayed after the merger. He moved over to VIT and then to Eureka College. The Winola qb, Ron (Butch) McCready, played for him at Eureka. Butch later coached at Roseville and Savannah before moving into administration. One of my classmates at Winola, Bob Frase, was a letterman fencer at the U of Illinois. He won a Big Ten title and competed in NCAA tourney. I would guess he may be one of a very few Cornbelt grads who ever competed in collegiate fencing. Also, the "new" high school in New Windsor was designed by Albert Heino, a Chicago architect who was married to my aunt Doris from New Windsor. After Al's death she moved back to New Windsor and spent a number of years teaching in the Winola system. 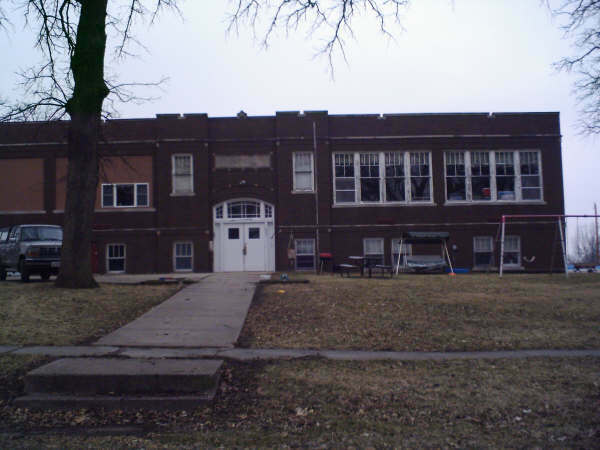 It's been a long time, but there are still great memories of days at Winola." "I love the concept of your site and I think I can be of some help. 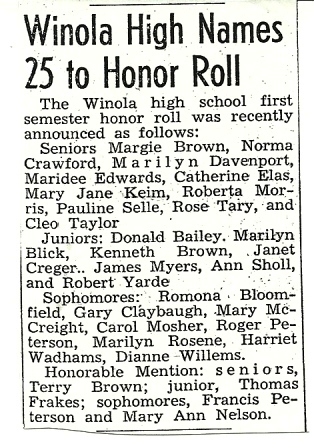 Winola HS opened in 1952 (class of '53 was the first graduating class). 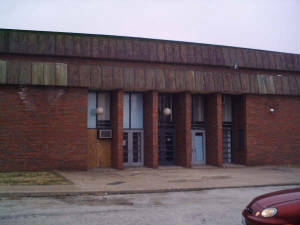 The school closed with the graduation of the class of 1988."